Since 2009, the college has offered veterinary services for dogs and cats at 2242 West Harrison Street, about two miles west of downtown Chicago in the Illinois Medical District. As the most visible of the college’s Chicago services, the Harrison Street facilities allow the college to better serve the pet owners and veterinary professionals in the state’s population center while opening new opportunities for recruiting and training students. The Medical District Veterinary Clinic at Illinois is committed to the highest standards of medical and surgical diagnosis and treatment and to a “low stress” philosophy in all interactions with dog and cat patients. 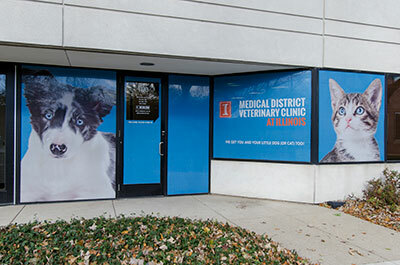 Medical District Veterinary Clinic at Illinois, which delivers primary care services for dogs and cats, is a busy urban practice where veterinary students gain experience that can’t be duplicated at the Veterinary Teaching Hospital in Urbana. Here students learn about speed and accuracy of diagnosis; client relation skills to develop a bond with pet and owner; low-stress handling of patients to ensure pet—and owner—are eager to return; and best practices in marketing and business processes. Clients identify with the Illinois brand and the clinic’s pet-centered focus, from Halloween costume parties for pets to social media interactions. The clinic is accredited by the American Animal Hospital Association. The Harrison Street facility has also housed Veterinary Behavior at Illinois, a behavior consulting practice offered by Dr. Kelly Ballantyne, and VSC at Illinois, an entrepreneurial collaboration between the college and Veterinary Specialty Center, a large specialty practice headquartered in Chicago’s northwest suburbs. A satellite office of the college’s Veterinary Diagnostic Laboratory is located within the Veterinary Specialty Center’s Buffalo Grove clinic. Having a presence in Chicago has strengthened the college’s involvement in the Veterinary Mentor Program, a partnership with Chicago’s Anti-Cruelty Society begun in 2000 that brings science-based programs to high school students interested in veterinary careers. The college has also established close ties to the Chicago Public School’s health careers program, which reaches students from the state’s most diverse population. Mentoring experiences and internships for youth interested in exploring a veterinary career are made possible at the Harrison Street facilities. The College of Veterinary Medicine and the School of Public Health at the University of Illinois-Chicago together offer a joint degree program leading to a Doctor of Veterinary Medicine degree and a master of public health degree within five years. Graduates are prepared to enter a variety of public health or regulatory careers. Read more about the DVM-MPH program. The Zoological Pathology Program is a service of the Veterinary Diagnostic Laboratory that is housed at the Chicago Zoological Society’s Brookfield Zoo and provides daily service to Brookfield Zoo as well as the Lincoln Park Zoological Gardens and the John G. Shedd Aquarium. This program, initiated in 1993, is a full-service diagnostic, teaching and research pathology program. It is currently the largest of only three programs in the United States offering full-time, exotic animal pathology training and the only program with established academic ties and incorporated domestic animal pathology training. Read about the activities of the Zoological Pathology Program. A three-year residency in zoological and aquatic animal medicine is offered by the college in conjunction with Chicago Zoological Society’s Brookfield Zoo and John G. Shedd Aquarium. Residents spend the first year in Urbana working with the exotic animal service at the Veterinary Teaching Hospital and the Wildlife Medical Clinic. For the final two years the resident is based primarily in Chicago and is supervised in part by a college faculty member who works full-time at Brookfield Zoo. Learn more about the zoological and aquatic animal medicine residency. There are many opportunities to support the work carried out by the college in Chicago, from assisting with indigent pet care to enhancing the experiences of veterinary students or prospective veterinary students. 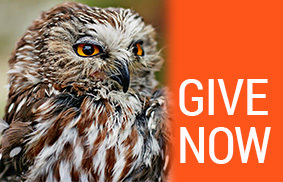 Other gift opportunities include such needs as equipment, outreach, and public education. To find out more, contact the college Office of Advancement at 217-333-2761.